Now that construction on your brand new home is complete, and you have moved in and unpacked, it’s time to plan a fantastic housewarming party for your friends, family and new neighbors! It’s the perfect occasion to welcome others into your home to show off your new space. We recommend playing true to tradition and keeping a housewarming party low-key, casual and stress free, but you can always plan for a more extravagant event. Did you recently attend a fantastic housewarming party? Tell us more about the event on our SeaGate Homes Facebook page! Don’t stress yourself out! It’s okay to wait a few months, or even 6 before inviting friends, family and neighbors over for a housewarming party. It takes the average family a few months to settle in to a new home. Traditional Party, or Open House Event? There are two types of housewarming events: A traditional party, and an open house. A traditional party will require a guest list, theme and a meticulously planned out evening as guests are assumed to stay for the majority of the evening. Open houses are very casual events where guests are expected to stop by for shorter periods of time, and mingle with one another. If you’re planning a traditional party, we recommend limiting the guest list to family, close friends and neighbors living on the same street. Guests should be invited via an invitation sent via snail mail, but if it is an open house event an emailed invitation is just fine. It’s only necessary to have a themed event if you are planning a traditional party. Barbecues, and wine tastings are two popular themes we have seen homeowners choose. And don’t forget to plan a few activities appropriate for the theme. Try and keep the menu simple! You don’t want to be kept in the kitchen throughout the evening. Assorted finger foods such as cheese and crackers, chicken wings or chicken fingers, bruschetta, or spinach dip are the easiest to prepare, and perfect for an open house event. If you’re hosting a barbecue, plan for grilled chicken and veggies, ribs, or hamburgers and hotdogs. PALM COAST, Fla. - SeaGate Homes has long been recognized as one of the premier homebuilders in the state of Florida for its high standard of construction, attention to detail, excellent value and satisfied customers. That recognition became a little greater recently as the company received another accolade to add to its fine reputation. 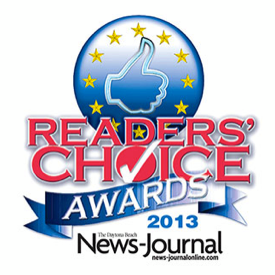 The Daytona Beach News-Journal rewarded SeaGate’s service to Florida’s homeowners with the “Best Home Builder” title in its 2013 local Readers’ Choice awards. It is the fourth consecutive year that SeaGate has won the title, showing that the company is a leader in the Daytona Beach, Palm Coast, and St. Augustine areas. The United States of America is turning 276 years old this July 4th! According to the US Census Bureau more than 41 million Americans spend the July 4th holiday celebrating at someone else’s home! How are you planning to celebrate? Are you still undecided? No problem! Check out our simple, fun and stress-free ideas straight from Pinterest for the perfect July 4th! The July 4th holiday is a busy time of the year, and it’s likely that you have not had time to run out to the store to find the perfect all-American outfit! To create this DIY tank, all you will need is a plain white t-shirt, red and blue spray paint, and painters tape. A few things to remember before beginning: 1) Place a cardboard barrier on the inside of the t-shirt to prevent paint bleeding, 2) Use a white t-shirt that is 1 size too big 3) Take your time! If you’re attending a 4th of July BBQ, and were asked to bring something, don’t stress because strawberry shortcake kabobs are super easy to make! All you will need to purchase at the store is refrigerated biscuit dough, strawberries, whipped cream topping and skewers! Finding and putting together last minute center pieces can be extremely stressful! For this July 4th, all you will need in order to create the perfect center piece are decorative glass jars, extra long sparklers, and a few patriotic flowers. Arrange the jars on the table with flowers and sparklers in alternating jars. The jars will look simple, clean and chic during the day, but will be the talk of the party later that night! Once the sun has gone down, light the sparklers, serve dessert and watch the show! Every great get together or party has a signature drink, so why not have one at your July 4th event? To create this layered drink, purchase Ocean Spray Cran-Apple juice, Gatorade G2 in blueberry-pomegranate and Sobe Pina Colada juice! Find a signature glass such as a mason jar to pour the drink mix into. Pour the juices into the glass in order of heaviest sugar content. Construction on your brand new home is finally complete, and moving day is just around the corner! Moving into a brand new home is always an exciting, busy and stressful time. There are a few things you can do to help alleviate stress for you and your family such as learning how to properly pack the perfect moving box. It may seem like such a small detail, but properly packing a box can make all of the difference during a move. Follow our simple steps, and you’ll be packing like a pro in no time! Tell us about your own moving tips and tricks on our SeaGate Homes Facebook page! When picking out boxes, select both large and small boxes. We always recommend placing heavier items such as books and dishes in smaller, compact boxes. If you place heavy items in larger boxes, they become too heavy to move, and often break during their transport. Use larger boxes for towels, pillows, bedding and other similar items. If there is extra space in a box, fill it in with towels, sheets and other linens. Filling in the spaces will help balance out the box and make it easier to move. Always put heavier items in the box first, and on the bottom, followed by lighter items on the top. We also recommend loading heavier boxes into the truck before lighter ones. around the top and bottom edges of the box. Always use packing paper to wrap breakable items, and then create bundles of six to seven items. A dish should always be packed on its side, and not flat. Sporadically place crumpled pieces of paper throughout the box to increase cushioning.